I very much hope that we see no heart attacks in Adderbury although some of the goings on in this village could provoke one! However, the village is prepared should anyone suffer a coronary. 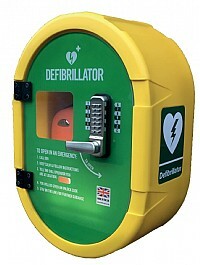 Thanks to generous donations from customers of The Bell, from Hook Norton Brewery and several local clubs and organisations, a defibrillator has now been installed on the front wall of The Bell. It is sited under the street light in an illuminated cabinet next to Adderbury Stores. It is available 24 hours per day and anyone requiring access to the unit needs to ‘phone 999 where they will be given the exact location, the code to unlock the cabinet and instructions on caring for the patient. It is an intelligent unit and although one hopes it will never be needed, it will not allow a shock to be administered unless it detects a requirement. Hook Norton Brewery have kindly offered to run training courses to ensure residents would feel comfortable if the need arose to operate the defibrillator. There will be two courses at The Bell on Thursday 7th March. The first will run from 2:30 pm to 4;30 pm and the second from 6:30 pm to 8:30 pm. They are free to attend and tea & coffee will be provided. Anyone wishing to attend should ‘phone The Bell on 01295 810338 or e-mail Chris Shallis to reserve a place. Congratulations to Chris Shallis who led this project and to all who contributed. This entry was posted in Local and tagged Adderbury, defibrilator, The Bell. Bookmark the permalink.